First and foremost, a big warm wordpress THANKYOU to all those who viewed and liked my last photographic post on the Edgelands in France – I think in the US you might call this the Sundown ???? In a few days a post in the memory of Walker Evans who has a huge exhibition in Paris at the moment. In the meantime … Many thanks to you all. I was up in Paris yesterday – massive security for the Trump visit; Mr T is here to enhance Franco American relations and also celebrate the US intervention in WW1 – “Lafayette nous voila” as Pershing said when the first “Doughboys” landed on French soil, though for the duration of the rest of WW1, the French called the Americans “Sammies” to encapsulate Uncle Sam and mirror the popular term for British troops who were referred to as “Tommies”. I was Mr T on the TV this morning, he made approving nods at the French military parade. Outside of North Korea, China and Russia, France is the only country that still does military parades – it is certainly the only Western Democracy that still exercises this “art” – but I like the French armed forces marching down the Champs Elysées – it saves to remind French people that we still have an army and it reinforces that link born within the French revolution of an army protecting the people (I guess more about that in a lengthy and reflective and annoying post) – No matter it is Bastille day – for the Americans, this is our 4th July – so BBQs dancing and fireworks tonight all over France. I am still wondering why Mr Trump is not staying in France tomorrow, because in the Catholic calendar of Saints, tomorrow is St Donald’s Day (might just have a roast duck for dinner with a bottle of St Saturnin (French readers will spot the joke) – I am still thinking of Mr Trumps approving looks as France displayed its military might in Paris – very approving but not so reassuring for the world, though he did say that he might make an small effort on climate change. No matter. 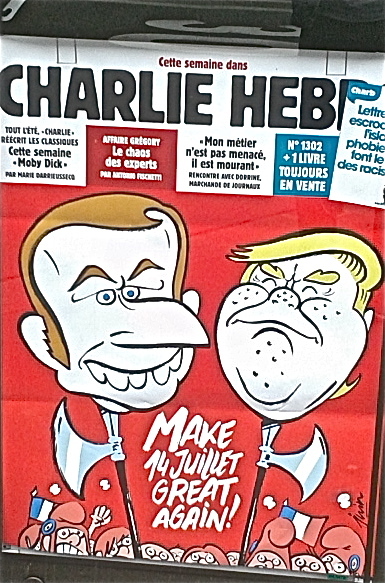 loads to do and loads to eat and drink, so I will leave you with this image – the front page of Charlie Hebdo – the satirical French news magazine. Happy Bastille day to you all. 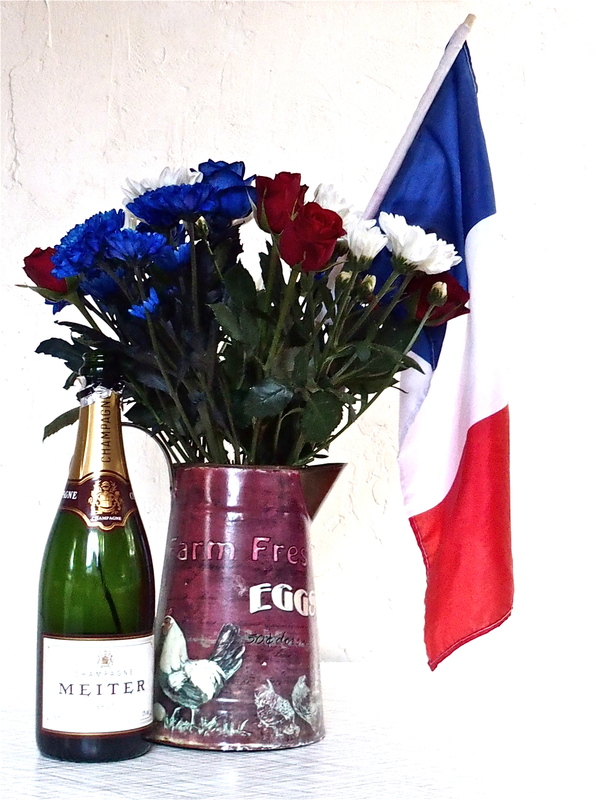 Posted in France, French, Military, Paris, photography, Revolution, summer and tagged Bastille Day. Bookmark the permalink.